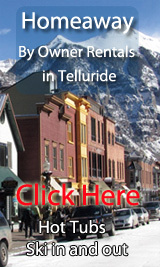 Find your own ski in and out by owner rental in Telluride-click on this link! Pick your own By Owner Vacation Rentals here for Telluride from our great list! 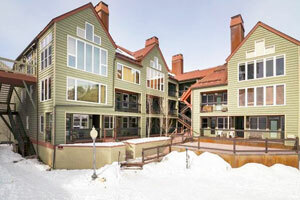 Luxury Ski-in Ski-out Apartment at Madeline in the Heart of MV/Telluride -1 bedroom, 1 bath, SLEEPS 4, from $714/nt -- Book it! VRBO 1118730-Guests are sure to enjoy a memorable vacation in this fully furnished, 1 bedroom 1 bathroom condo. The main/master bedroom has a king-sized bed, a walk-in wardrobe and a balcony with a table and chairs, while the remaining room is furnished with a queen-sized sofa-bed. The property sleeps 4 people. The living room is fully furnished, has a desk for your laptop and a stunning fireplace. This area also integrates a dining table for four people. The kitchen is perfect for cooking up a feast as it is equipped with the top quality appliances. My apartemnt is ituated on the 2nd floor, the same as the the pool and the Sky Terrace. My Guests can enjoy an afternoon of skiing follwed by some pool time and later watch the sunset from the pool area with a panoramic mountain view. You will receive full access to the Hotel amenities, including the Sky Terrace, Fitness Center, 20 Below (kids’ club), M Club and Ski Valet during the Ski Season. Coonskin Ski Lift Base Area Is Your Front Yard - -1 bedroom, 1 bath, SLEEPS 4, from $200/nt -- Book it! Up one flight of stairs from the street level or 5 steps up from the snow level to the complex's terrazzo, you'll enter this unit from the designated stairwell. To the right on entry is the living room with a leather sofa with queen-sleeper with memory foam, 30-inch flat-screen TV(HDMI) with cable and DVD player, and boombox with radio/tape/CD player. In warm weather, open the door to the shared porch to make the most of the view and fresh mountain air. The open floor plan also has a small kitchen with all the essentials (coffee-maker, toaster, microwave) and dinette that seats 4-6. In the bedroom, there is a queen bed and TV, and a landline phone. The bathroom is between the living room and bedroom, and has a shower only (4-inch step-in). The complex is ski-in/ski-out via Lift #7 (Coonskin), with a common outdoor hot tub looking right up the Milkrun ski run. The building's coin-op washer/dryer is in the utility room downstairs from the terrazzo level. Please note that this condo has NO DESIGNATED PARKING. A parking permit will be provided for one vehicle in the Shandoka parking lot across the street on a first come, first serve basis. 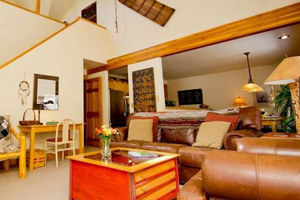 Meadows, mountains, and more - Ski in/out: Meadow Grove at the Terraces - -2 bedroom, 2 bath, SLEEPS 5, from $382/nt -- Book it! 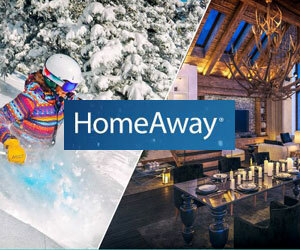 Homeaway 3796198-Ski in. Chill out. At Meadow Grove, you can do both. This spacious condo not only offers Lift 1 access right out the front door, but it’s also a quick chondola ride into Mountain Village core, where you’ll find great shops and restaurants. So pop over to the famed Tomboy Tavern for dinner and watch the big game while sipping on a great craft beer. 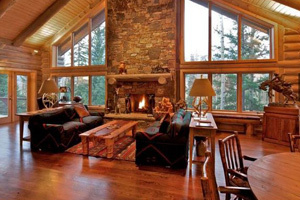 After dinner, return home, turn on the big flatscreen TV in the living room and relax to the warmth of the fireplace. Let’s face it, you deserve a vacation. You deserve Meadow Grove. 2 Bedroom 2 Bath w/ Mountain Views located directly at lift 7 & the river trail -2 bedroom, 2 bath, SLEEPS 6, from $207/nt -- Book it! VRBO 934161-This beautiful and remodelled ski-in/ski-out condominium sits directly at the base of lift 7 and is literally one of the very closest condos to a lift in all of Telluride and one of the best locations in Cimarron Lodge. Views to the front are of the Telluride Ski Area, to the rear is the San Miguel River, and the incredible Telluride River Trail. 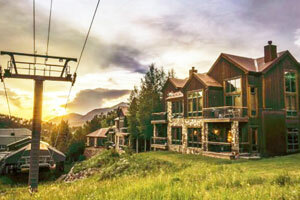 The large private deck overlooks the Telluride Ski Area with spectacular views of the ski runs and lift 7. This condo is also adjacent to the Telluride Valley Floor with miles of nordic cross country skiing as well as walking distance to all of Telluride's shops and restaurants and the gondola. The condo is decorated beautifully and tastefully. There is an incredibly comfortable king-sized bed in the master suite, a queen in the second bedroom, and a queen sofa sleeper in the living room with high end linens. The kitchen is fully equiped, and offers all the comforts of home. The bathrooms are highly upgraded with stunning travertine floors and counters and bronze oil fixtures. The condo also has a high speed broadband internet connection with FREE WI-FI. 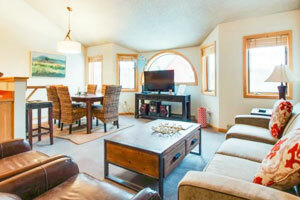 Smuggler #B -2 bedroom, 2 bath, SLEEPS 6, from $169/nt -- Book it! Trip Advisor #FKN2190804-Great family condominium on Telluride's popular west end! This 2 bedroom plus loft condo is located on S. Mahoney Street, just two and half blocks from the base of Lift 7. Bedding: queen in the master bedroom, 2 twins in the second bedroom and a queen in the loft. You enter this condo from the second floor and there are 2 levels to the condo. On the main level is a newly remodeled full kitchen with stainless steel appliances and granite counter tops and dining area with seating for 6, as well as a cozy bay window with great views of Telluride and this Victorian-style neighborhood. The spacious living room has plenty of seating and a flat screen TV and DVD. Walk to slopes & Main St from condo w/shared seasonal pool and hot tub - -2 bedroom, 2 bath, SLEEPS 8, -- Book it! VRBO 982328-Whether you're soaking in the shared hot tub, doing a few laps in the seasonal pool, or hitting the slopes, this Telluride condo puts it all within easy reach. 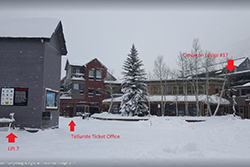 Just a short walk from Chair 7 of Telluride Ski Resort and Main Street, you'll be able to hit the slopes, dive into dining options, and shop all just a short walk from your condo. Flip through the cable channels or watch a DVD on the flatscreen HDTV while you relax on the comfy couch. Turn some music on the stereo while the private washer/dryer does the laundry. Put out a few small bites on the breakfast bar while you work on the main dish in the open kitchen. Let the dishwasher do the cleanup while you eat at the dining room table. This two-bedroom (plus loft), two-bathroom home will play host to up to eight guests. There are queen-size beds in both bedrooms. The loft features twin-size beds, and the bathroom on the main level boasts a jetted tub. Hunter's Lodge-5 bed, 7 bath, SLEEPS 12, from $1000/nt- Book it! Trip Advisor #FKN2173404 -Hunters Lodge provides a rare offering in Mountain Village – a spacious five-bedroom, log and stone private home, just a few minutes walk to the village core. This home was one of the first homes built in Mountain Village, and therefore boasts one of the best locations, just a short walk to the slopes, the market and the gondola. Very few homes in Mountain Village have such superb convenience! The guest enters the home on the middle floor, where there is a warm, inviting great room featuring a kitchen, bar, dining table, and seating surrounding a wood burning fireplace. The kitchen has modern appliances from Viking and Fischer & Paykel. There is also a laundry off the kitchen, a half-bathroom and a ski room to the left of the entrance. On each side of the great room are two large king suites, each with a private bathroom and flat screen TV. There are also two separate decks off either side of the great room, which can be accessed from the king suites too. There is a grill on the right hand deck. On the top floor of the home are two queen suites, each with a private bathroom and flat screen TVs. 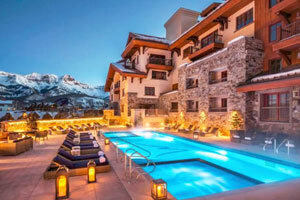 Telluride By Owner Rentals - Our Blog! Great Deal: Coonskin Ski Lift Base Area Is Your Front Yard - -1 bedroom, 1 bath, slps 4, from $200/nt -- Book it!